Water contamination is increasing in spite of stricter regulations and laws surrounding the use of toxic chemicals. In some cases, people who have been diagnosed with cancer or respiratory ailments or who have given birth to a child with defects receive a notice about contaminated water in their neighborhood. However, in other cases, residents of a neighborhood may notice that many people in the neighborhood suffer from the same illness and discover that a corporation has been dumping toxic materials into the water. 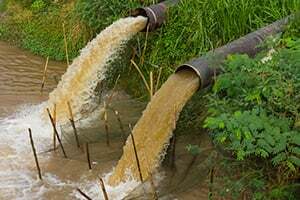 If your neighbors and you are located near a refinery or another industrial site and suffer from serious illnesses that you believe may be linked to water pollution, you should consult the experienced water contamination attorneys at Moll Law Group. We are available to advise you on whether you may have a claim and use our experience as toxic torts lawyers to advocate for you if you do. There are numerous toxic or carcinogenic substances that may contaminate water used in households, including benzene, nitrate, arsenic, lead, petroleum, oil, gas, volatile organic compounds, TCE, phenols, and more. Well water may be polluted from the contaminants used in gas stations, incinerators, railroad yards, landfills, and oil refineries. In addition to contamination from industrial practices, groundwater can also be contaminated from the agricultural use of pesticides and fertilizers or from untreated septic waste. Drinking contaminated water can result in significant health risks and damage to major organs in the body, including the kidneys, liver, or reproductive organs. Both state and federal environmental laws identify contaminants that must be regulated in connection with drinking water. The Clean Water Act, for example, is the federal law related to the quality of water. This law allows anyone who is or might be affected by water contamination to sue with the assistance of a water contamination lawyer and ask a federal judge for an injunction against further contamination as well as civil penalties, fees, and costs. However, when the water pollution is known with scientific certainty, and the party responsible for the pollution is also known, it may be appropriate to sue under state law. What must be proven depends on the circumstances of the individual case. Generally, however, one of the most complex elements to prove in a water contamination case is causation. You will need to establish that the water contamination caused your illness. When well water was contaminated long ago, it can be difficult to trace the connection from the defendant's contamination of that water to the health issues of present-day residents or workers. If you successfully prove a corporation's liability for negligence, you may be able to recover compensation for both economic and noneconomic harms. These often include medical bills, lost income, lost earning capacity, disability, pain and suffering, and loss of enjoyment of life. If a defendant's conduct is particularly egregious, moreover, such as when a corporation knows that it is dumping toxic chemicals into the water with insufficient protections in place, it may be possible for injured people to recover punitive damages. These are damages that are intended to punish the defendant and deter similar future misconduct. If you believe you developed an illness or health condition because of polluted water, the water contamination lawyers at Moll Law Group are available to help you investigate your options and advocate for you to the fullest extent of the law. We are committed to pursuing justice for injured people throughout the U.S., including in states such as Michigan, Texas, Ohio, Pennsylvania, Illinois, New York, Florida, and California. Billions of dollars have been recovered in lawsuits in which our firm has been involved. Contact us online or call us at 312-462-1700 to set up a free consultation with a water or land contamination attorney.